← How well does an Ultra Compact City do “Eco City”? So, you may have concluded that transport will be pretty dreary in an Ultra Compact City, with all travels being done under ground? Well, why not try to liven it up, with skywalks and flying cars? Cable cars are grossly underestimated as modes of public transport. When it comes to transporting a very large number of people relatively short distances they are unrivalled, and since they come and go continuously “waiting for the bus” will be a thing of the past. They are also electrically driven and pretty energy efficient, and they can be the arteries of a walking based transport network. If they are so great, why aren’t they more popular? The answer lies partially in the difficulty of retrofitting such an installation to an existing city. It can be difficult – at least in dense areas. But if the city is being built from scratch it can be planned with gondola stations in high-rise buildings and cable car lines going up and down the entire city. 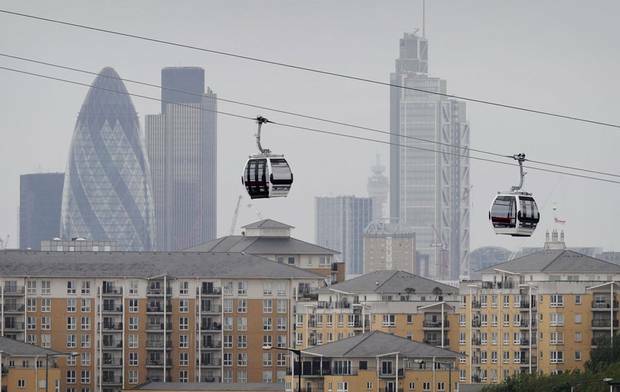 To get access to the cable car stations a public street network could be created somewhere around 30th or 40th floor of the city, with bridges between the skyscrapers connecting a floor of shopping-centres in each building. The cable car stations would be located a couple of floors above this skystreet and the whole thing would be connected to ground level with public access lifts. The end result would be a very pleasant 2nd street level, useful for walking from your home to the cable-car link, and then from the cable car station to your final destination. When going back home you just pick up some groceries from a local deli from dinner – no hassle. This entry was posted in City Planning, Ultra Compact City Concept and tagged eco cities, Ultra Compact City Concept, urban transport. Bookmark the permalink.